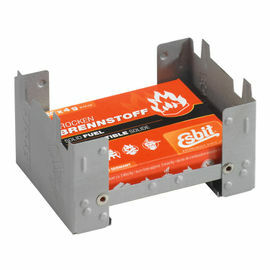 The Esbit Alcohol Burner is a lightweight and compact meths-burning camping stove, based on the classic Trangia design. 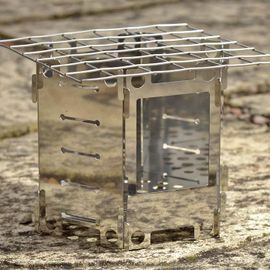 This model by Esbit is a particular favourite of Ray's, thanks in part to the addition of a collapsible handle; this small feature allows the burner to be used with other small stove sets such as The Pocket Stove with much greater ease. The beauty of the Esbit Alcohol Burner lies in its small size, low weight and versatility. 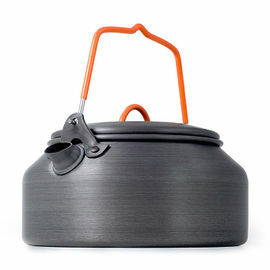 The complete stove weighs just 92 g and will fit easily within your pack, while meths fuel is widely available. 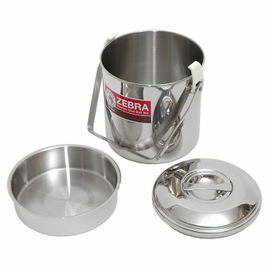 Ray's personal setup includes the Esbit Alcohol Burner, which he places underneath the Littlbug Junior Stove; both of these items then fit neatly inside the Zebra 12 cm Billy Can with the internal dish removed, resulting in a surprisingly neat and compact cooking set for solo trips. Esbit Alcohol Burner is rated 5/5 based on 7 customer reviews. While not the lightest alcohol burner out there it feels robust and the design is well thought out. 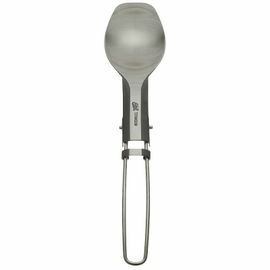 It lights easily and brings water to the boil quickly. The handle on the snuffer is a nice touch. 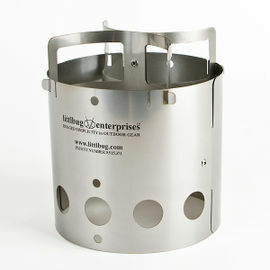 Excellent alcohol burner which is conveniently small, yet sufficiently hot enough to use with the Littlebug camping stove. Works well in my Honey Stove. A little fiddly but never having had anything like this before I have no frame of reference. I do wonder how long the rivet on the flame control will last but is fine so far (used 8 or 9 times). The burn time is more than adequate to cook a meal and then boil water for a brew. The flame can be very hard to see in daylight but presumably this is an issue for any meths burner. Certainly fit for purpose. A compact, fantastic wee burner. For the price the product quality is fairly good. The rubber O-ring ensures no leakage and a fairly strong lock with the lid. The snuff provided has a flame regulator which is held on by a pop rivet; don't see it lasting too long. Used with methylated spirits and boiled a 14 cm diameter 3/4-full Zebra billy can of cold water in around 11 minutes (overhang without stove/wind protection). Works with the original crusader cook set, however I would recommend pairing with a Honey Stove or something with more clearance to allow better oxygen flow. Nice little alcohol burner. Looks very much like the Trangia burner, and functions the same way. The Esbit burner however, has a handle attached to the simmer ring, which allows you to adjust the flame without burning your fingers. And that is a very good thing. Good quality product. Just remember to break it in before you take it out in the woods for the first time. I do not know why, but you have to use it a few times before the jets starts working properly. This is the case with several alcohol burners. Just the way it is. This kind of alcohol burner has been on the market for a very long time, and there is a reason for that. Old school alcohol burner. The only difference between the Esbit and Trangia is the simmer ring, apart from the handy handle. 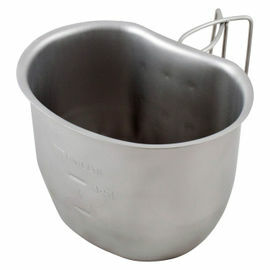 The stainless steel doesn't blister and pit as anyone who has used the Trangia will know and be familiar with. You can also rely on Mr. Mears' recommendation without question.